As Geoff and I make dinner, Kyra (age 12) carries a stainless steel bucket in from the cow barn, bracing her small frame sideways against its weight. White froth laps at the rim, floating atop two gallons of milk, just pulled from Daisy’s udder by Kyra’s strong hands. I help Kyra lift the bucket onto the counter. She smiles. I smile. Well done! Milk! She goes back out into the evening’s dark, headlight on, to feed the chickens. I pull a stainless steel pot from the refrigerator that is filled with milk from this morning’s chores. The surface of the milk is firm with cream. I grab a quart jar and our bell-bottomed skimming spoon, and begin to run the edge of the spoon across the yellowy surface. A thick layer folds in front of the spoon, buckling on top of itself, before yielding in a mass to the curve. I lift my arm, spoon the cream into the waiting jar, then return and repeat. Suddenly, as my arm completes another arc of skimming and spooning, I feel a rush of tears. I haven’t skimmed cream in over two months. We had dried Daisy off before her due date, and had no other cows to milk. 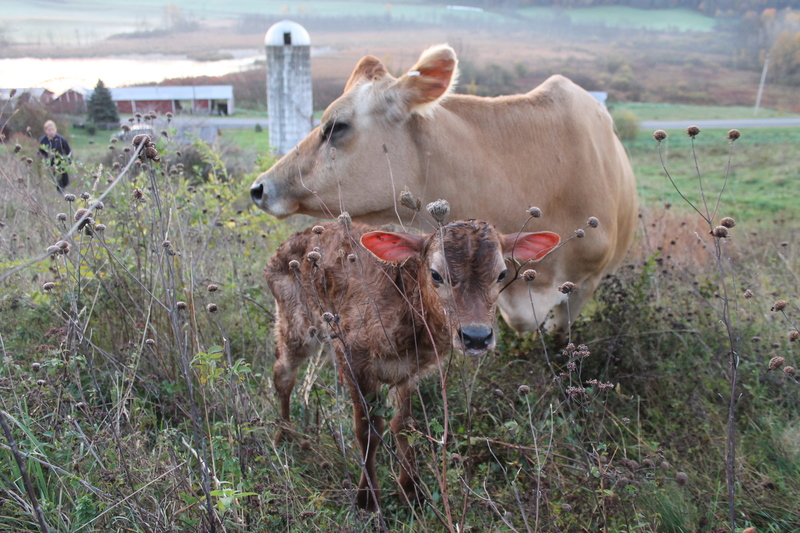 Then, on October 19, Daisy gave birth, and so here we are again—back in the milk. Here I am again—skimming—and crying? Why? How ridiculous! I am just doing my ordinary chore! Yet, I feel relief. I feel gratitude; I feel joy. But most of all I feel love. A large love. A seemingly religious love. While skimming cream? What is going on? I ponder this strange sensation as I continue to fill my quart jar. Am I happy to be drinking raw milk again? Yes, I am. I believe in raw milk. I believe that pasteurization kills beneficial bacteria as well as enzymes that aid in digestion. I believe that homogenizing ensures that those dead particulates don’t settle into silt at the bottom of a carton. This milk is alive. It glows. But that isn’t it. Am I glad to be eating locally? Yes, I am. This milk did not require any diesel-burning trucking or train-ing to get from cow to kitchen, and I appreciate that. But that isn’t it either. Is it just that this milk is so delicious? True, it tastes so good. Everything we make from it tastes so good—the ice cream, of course, but also the hard cheeses (cheddar, jack, parmesan), the soft cheeses (mozzarella, ricotta, queso fresco), the butter, yogurt, half and half (for Geoff’s coffee), and the skimmed milked itself. Everyone in our family agrees (though some are less enthusiastic about the sharper cheeses). Now we can make more of these goods again. But that isn’t what is making these tears well. No, as pearly white milk shines from beneath the cleared cream, I realize that these tears mean something else. As I skim and spoon and stir and pour, making these simple bodily movements, this milk is for me a direct, living connection to the earth. I helped my son buy this cow seven years ago. We have raised her, cared for her, fed and watered her; built fences for her and hauled bales for her. We have done the work together. Our kids have done the work together. Daisy, in turn, has spent countless hours munching grass from our hillsides and fertilizing the soil with her manure. Year after year she has taken that grass and given it back to us as milk, pulled and carried from barn to house by Jordan, Jessica, and now Kyra. This milk is more than just milk. It is a one moment of an energy circuit streaming from sun to soil to grass to cow to bucket to child to cheese and back again—back through the movements those milk-fed children make in caring for the cow who fertilizes the earth that supports the sun-catching grass. Standing at the kitchen table, spoon in hand, I know. I am part of it. I am a mere loop in the chain, a small but enabling arc of this life-enabling circuit. Standing at the kitchen table, spoon in hand, I know myself as someone who is participating in this rhythm of bodily becoming, making it real, making myself real as an expression of it. And it feels like love. This milk is just milk. Yet it is more than just milk. It nourishes our bodily selves. It nourishes more than our bodily selves. Working for it, with it, by virtue of its enabling calories, I am flooded with feelings of gratitude for the abundance—for the family, the farm, and the great green earth—that it represents. This milk nourishes spirit. I pour the skimmed milk into half gallon glass bottles, wash the stainless steel pot, fill it with warm milk from Kyra’s bucket, and place the pot back into the refrigerator, where it will wait for 12 hours—until the next skimming time. I can’t stop thinking about this skimming moment from over a week ago. It was so unexpected! And the fact that it was so unexpected is itself revealing. My surprise was indicative of our cultural perceptions of pleasure, especially around food. I offer three thoughts. First. Our processes of food production and distribution—from far away farms to supermarket shelves—have so narrowed our sensory experience of food that we associate the pleasure of food primarily with eating, and then again, with taste and amount. It is what we know. It is what we can buy. Pacing the supermarket aisles, we are met by row after row of distilled substances pressed ‘free’ from the bran, the chaff, the skin, the seeds, the crust, the meat, the fiber, the bulk, and then processed with copious quantities of sugar and salt. Seeking more taste and larger amounts, we opt for foods that have been stripped and sliced, whitened and washed, juiced and refined, even already cooked and served. Once these distilled substances blast through our sensory selves, we who consume feel full and empty all at once. Our pleasure is partial; we assume we need more of the same. And so, shopping and consuming, we become addicted to foods that train our sensory selves to ignore the spectrum of possible pleasures that making food can provide. While grabbing a plastic gallon from the refrigerator compartment enroute to the checkout, we forget the pleasures of calf kisses, chin scratches, and fuzzy winter cow coats. We forget the sounds of milk pinging the pail, or of baby bleats and mama moos. We forget the smell of grass growing and cut, wet and dry; or the vivid splashes of sunset and sunrise. When pulling a block of cheese from one shelf and a carton of frozen dessert from another, we forget the resilient stretch of a newly made mozzarella, or the melting sweetness of freshly cranked ice cream. Sure, there is muck and mess to remember as well. Cows poop. Calves slobber. Buckets topple. Milk sours. Cheeses mold. Ice cream clots. But somehow, having a personal experience of everything that can go wrong serves to amplify and expand that feeling of pleasure when it all goes right. This line of thinking pulled into view a second. The sensory training to taste and amount that we receive not only teaches us to forget the pleasures of the food-making process, it teaches us to forget that pleasure itself requires a process, else it does not fully engage and satisfy our capacity for it. Pleasure is an arc, a rhythm—not a one-stop shop. It unfolds in time, over time, through the movements we make, and especially in relation to food. The waiting. The watching. The growing. The picking. The making. The baking. The bonding. The stopping. The beginning again. Finally, as our experiences of buying and eating food narrow the range of known pleasure, it become possible to imagine that pleasure, even as a process, exists for its own sake, for personal use. It does not. This idea is an ecological hazard. What is lost when pleasure narrows to the question of personal satisfaction is not simply sensation. We may actually experience quite exalted states from our refined food substances. Rather, what is lost is an internal array of sensory experiences that can guide us in making earth-friendly decisions about what to eat, when, where, and how. We forget that food is our primary connection to earth. We forget that food is earth making more of itself. We forget that we too—in how and what and when and where we eat—are part of that process through which the earth becomes what it is. Alternately, the channels of pleasure we can open through our participation in the food making process provide us with the surest guide we have for giving back to the sources of what pleases us. Pleasure points us and propels us to do what we can and must to enable its sources to grow and thrive. In so far as we know that the pleasure of food comes from participating in the earth’s bodily becoming, then, we will do all that we can to give back to the earth what it needs to continue giving to us. We come to want the health of the soil and water and air; of the animals and plants, of our children and of ourselves. And we are willing and able to persevere in pursuit of it because we know what that health feels like. Am I saying that everyone should own a cow? No, of course not. But everyone can find some point in relationship to food to cultivate sensory awareness of how he or she is participating in the ongoing life of the earth. Does having a cow protect our family from making choices that addict us to unsustainable resources? No. We are not immune. But it is my hope that, because of our milking connection—and the pleasure we feel in nurturing it—we will be more apt to notice what we are doing, more likely to be troubled by our own actions, and eventually, more willing and able to make a change that brings those aspects of ongoing life in line with what we are learning matters most. This entry was posted in animals, bodily movement, family, farming, green living, kids, philosophy, relationships, religion and tagged bodily becoming, cattle, earth, family, farm, food, milk, pleasure, religion on October 31, 2013 by Kimerer.